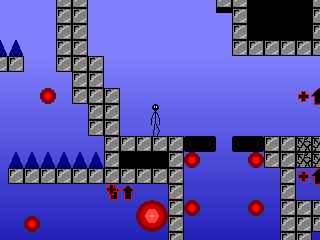 In Super Stickman Escape, your character has to run, jump, transform, and explore in order to collect all the items and escape from the complex where he's held prisoner. Graphics in this game are used very well, just where you'd expect them while letting you focus on what you like. Messages appear on the bottom after a music change, the player has an animated idle and separate images for different directions in the air, and there are slight animations on powerups and bonuses to catch your attention, among other things. While used wonderfully, the graphics themselves need work, in my opinion. One may complain that you can't make a stickman look like much else than a stick, but anyone who has seen the Xiao Xiao style knows that rounded edges and thick build make for a very realistic and easy to animate character. Other graphics seem needlessly bulky, with an abundance of black outlines and one-color fills, and a font that is pointlessly difficult to read. I wouldn't say the game looks bad, however. Not too many platform games classify as both action and adventure while still not having swarming baddies. Replay value is quite high in Super Stickman Escape, anyway, because the way the powerups and goals are presented, you're always wanting to go back to 'this one part' or 'that one save point' and try and get the secret you missed, or find a new area to explore, as long as you aren't put off by the graphics mode, like I happen to be. This is, like many games, a distraction to return to when you're bored/procrastinating. Nobody has shared their opinion about Super Stickman Escape yet. Be the first. Recommendations: The 4 people who like Super Stickman Escape also like the following games. This game is a lot like super metroid, but I gathered it was suposed to be as there was actually a track from it included. Anyway, the game was very fun and its one of the few GM games I've actually finished. I also discovered a bomb bounce glitch where if you hold up, down, and Z at the same time you can create an infinite string of bombs. If you tap this combination you can pretty much go anywhere you want given enough time. Oh, and try the original, its pretty good too. Using some nifty sequence breaking I finished with 31.25% I dare anyone to get a lower score than that. That was one of the best games i have played on game maker! THIS GAME RULES!!!!!!! O Please make another one!! The game was challenging and fun! Much better than the predecessor, much longer too, and many more power ups. This is one of a kind (well except for Stickman Escape). Still one level, but its much larger, though that can be a downfall as its very slow at times. With lots of new types of powers ups as well as old, this is a GM classic. Some things that give it a downfall are its graphics still aren't the best and it can be very slow and hard at times. But, if you try to beat this on your own, you'll have a good challenge, as the invisible walls and fake walls give it a lot of difficulty. Very fun, almost perfect except its a real hard sometimes to see whats next and its a bit slow. Better than the first, the look much more decent now, but still aren't the best. Still a very original idea, but its a bit too much like the predecessor. Being as long as it is, and trying to reach the goal of 100%, this game has a lot of replayability. Very good, much longer and a lot of new power ups.